As you may have gathered from the title, this is a follow-up to a post I wrote a some time ago regarding role-based authentication/authorization in single page applications. 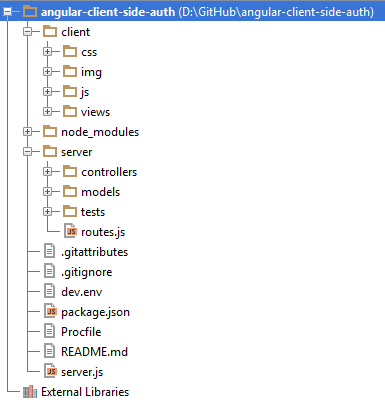 This time I'd like to highlight how I implemented routing and authorization in the Node.js server that complements my Angular client. Since you can never trust that the client code hasn’t been tampered with by the user, it’s paramount to have a good authentication/authorization strategy on the server. The client-side auth scheme I introduced earlier is simply a convenient way to customize the user interface – proper authentication/authorization should always be left up to the server-side. I am using Node.js/Express along with the excellent Passport.js authentication middleware, but hopefully it shouldn't be too much bother to apply the same patterns to other server-side frameworks. You can see an example of this scheme implemented in this GitHub repo, and I have a live version of it running on Heroku. Before I actually start up the server in server.js I will register my own routes by calling the module defined in routes.js. Let’s take a closer look at it. accessLevel The access level of the route. If the user requesting the route doesn’t have access a 403 Unauthorized will be returned. If this property is not present, an access level of public is assumed. To enforce the access levels I’ve set on my routes I made a middleware component. This middleware component will calculate whether the current user has access to the requested route using a bitwise AND operation on the access level of the route and role of the requesting user. If the user is found to not have access the sever will respond with a HTTP 403, and break out of the middleware chain. You might also notice that I fall back on the respective public values for access levels and user roles by default if no user is logged in or if the route does not contain the accessLevel property. So, now I need to register my routes with express and make sure that the ensureAuthorized middleware is run on all of them. I usually perform this logic in the function I export from the routes.js file, so that I can easily call it, and thus register my routes, from my server.js file. The function loops over the routes array, prepending each route’s middleware arrays with the ensureAuthorized component, and then registering it with express according to the other route metadata. And that’s it! I want to remind that you can see a more comprehensive example in this Github repo. If you want a better understanding of how this approach works, I highly recommend that you clone and mess around with it a little bit. And if you have any questions or issues, just post a comment here or an issue on Github.